Collateral source: Expulsion of of Hyksos (lived around Avaris, Egypt aka: Tell el-Dab'a) in Egyptian documents & wall paintings. Joseph's court seals have even possibly been found in Avaris. Also, A "cry out" to "L", one of the first letters indicating the Hebrew God has been found inscribed on Egyptian walls. Avaris is also the location of Rameses, the place where the Israelites settled (Genesis 47:11) and where they departed from (Exodus 12:37). 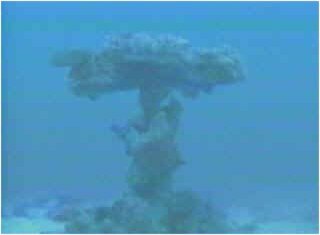 "He rebuked the Red sea also, and it was dried up: so he led them through the depths, as through the wilderness. And he saved them from the hand of him that hated them, and redeemed them from the hand of the enemy. And the waters covered their enemies: there was not one of them left." Compare Moses' description in the Bible below about the events surrounding the escape from Egypt, with the following 8 ancient inscriptions found on different cliffs in the Wadi Sidra area of the Sinai. 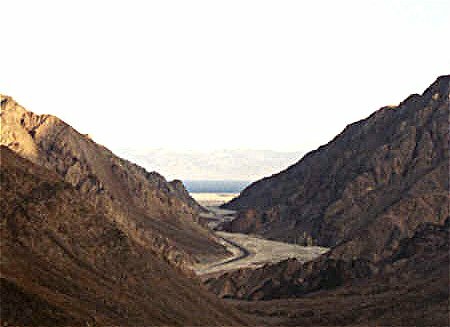 Wadi Sidra is a possible natural route the Jews may have chosen in the Sinai after escaping Egypt. The exact route remains uncertain. "The wind blowing, the sea dividing into parts, they pass over"
"The Hebrews flee through the sea; the sea is turned into dry land." "The waters permitted and dismissed to flow, burst rushing unawares upon the astonished men, congregated from quarters banded together to slay treacherously being lifted up with pride." "The leader divideth asunder the sea, its waves roaring. The people enter, and pass through the midst of the waters." they go jumping and skipping. taking flight from the face of the enemy. The surge of the sea is divided." "The people flee, the tribes descend into the deep. The people enter the waters. The people enter and penetrate through the midst. The people are filled with stupor and perturbation. Jehovah is the keeper and companion." "Their enemies weep for the dead, the virgins are wailing. The sea flowing down overwhelmed them. The waters were let loose to flow again." the only way of escape for the congregated people." Above found in Grant R. Jeffrey's "The Signature of God"
In 518 A.D. Cosmas Indicopleustes, a Byzantine Christian writer, also mentions the ancient inscriptions. Concerning them he stated that they appeared "at all halting places, all the stones in that region which were broken off from the mountains, written with carved Hebrew characters. "288/49 Cosmos came to the conclusion that they were made by the Israelites fleeing Egypt. Other explorers which confirmed these inscriptions were Bishop Robert Clayton of Ireland (1753) and Rev. Charles Forster who published these findings in a book in 1862. He came to the conclusion that these inscriptions were a combination of both Hebrew and Egyptian alphabets describing Israel’s exodus out of Egypt. In 1761 a German explorer Barthold Niebuhr found an extensive ruined cemetery grave site of Jews which was discovered in the Sinai with inscriptions confirming they died as a result of Yehovah’s supernatural plague mentioned in Numbers 11:34-35. -The writers of those inscriptions which vividly describe the major events of the Exodus do not use any of the words or language that Moses uses to describe the same. In other words, they are obviously not inspired by Moses' writings. They are plainly written in the context of independent witnesses to these events. Josephus in Josephus Against Apion. I, 26, 27, 32 mentions two Egyptian priest-scholars: Manetho and Cheremon who in their histories of Egypt specifically named Joseph and Moses as leaders of the Jewish race. Josephus states that Manetho and Cheremon stated that the Jews rejected Egypt’s customs and gods. They noted that the Jews practiced animal sacrifices which they witnessed on the first Passover. These historians also confirmed that the Israelites migrated to "southern Syria" which was the Egyptian name for Palestine. They also mentioned that Israel’s exodus occurred during the reign of Amenophis who was the son of Rameses and the father of Sethos who reigned toward the close of the 18th dynasty which places the Israelites exodus between 1500 and 1400 BC. This confirms the Old Testament’s chronology for the exodus occurring in 1460 BC. So what happened to the bodies of all the Hebrew escaped slaves who died from this plague? A mountaintop Graveyard found. In 1761, Barthold Niebuhr, a German explorer, found a huge cemetery with tombs and a sepulcher atop an inaccessible mountain called Sarbut-el-Khaden. Inscriptions were found on the tombs and inside the sepulcher. (Voyage en Arabie, tom. i. p. 191). Niebuhr offered his doubts that the inscriptions were made by Egyptians as no carved inscriptions were ever found in Egypt; rather they were partial to painting images on plaster. He also found legible inscriptions not only on the tombs but also within a small temple carved out of rock, all found to be of the same written language as the Hebrew Exodus inscriptions. In another book, Niebuhr remarked "the wonderful preservation of the inscriptions upon this soft sandstone, exposed as they have been to the air and weather during the lapse of so many ages. On some of the stones they are quite perfect" (Niebuhr, Biblical Researches, vol. i. pp. 113-114). He found, as in the other Sinai inscriptions, that the hieroglyph-like writings were significantly different in form from Egyptian hieroglyphics, yet sharing similarities nonetheless. Also, no mention of Egyptian gods or common Egyptian symbols are to be found in the mountain-top graveyard. In addition to all of this, Niebuhr found numerous engravings of quails on the tombstones "standing, flying and apparently, even trussed and cooked" (Rev. Charles Forster, Sinai Photographed [London: Richard Bentley, 1862], p. 62) and noted that the Bedouins refer to this graveyard as the "Turbet es Yahoud" (grave of the Jews). -The apostates smitten with disease by God, by means of feathered fowls. -Smitten by God with disease in the sandy plain, (when) exceeding the bounds of moderation. -Sickening, smitten by God with disease; their marrows corrupted by God by means of the feathered fowls. -The people, given over to destruction, cry aloud. -God pours down deep sleep, messenger of death, upon the pilgrims. -The tomb is the end of life to the sick, smitten with disease by God." -Miriam, Prophetess of lying lips an deceitful tongue. -She causes the tribes to conspire against the pillar and prince of the people. -Convoked for tumult, perverted, full of strife, the people revile the meek and generous man. -They lead with reproaches the blessed one of God. -Bitten and destroyed by fiery, hissing serpents, the Hebrews are wounded for their crimes. -Jehovah makes a stream flow from the stony rock. The people, given over to destruction, cry aloud. messenger of death, upon the pilgrims. smitten with disease by God." -The Hebrews Murmur Against Moses / God Provides Water Miraculously. -Pilgrims fugitive through the sea find a place of refuge at Sidri. -Lighting upon plain ground they proceed on their pilgrimage full of terror. -The Hebrews pass over the sea into the wide waterless desert, famishing with hunger and thirst. -The people clamor vociferously. The people anger Moses. -Swerving from the right way, they thirst for water insatiably. -The water flows, gently gushing out of the stony rock. -Out of the rock a murmur of abundant waters. -Out of the hard stone a springing well. -Like the wild braying, the Hebrews swallow down enormously and greedily. -Greedy of food like infants, they plunge into sin against Jehovah. -Jehovah gives them drink again and again. -The people sore athirst, drink vehemently. -They quaff the water-spring without pause, ever drinking. -Reprobate beside the gushing well-spring. -God Judges The People's Gluttony. -The people have drink to satiety. In crowds they swill. -Flesh they strip from the bone, mangling it. -Replete with food, they are obstreperous. -Surfeited, they cram themselves; clamoring, they vomit. -The people are drinking water to repletion. -The tribes, weeping for the dead, cry aloud with downcast eyes. -The dove mourns, devoured by grief. -The hungry ! ??? the tempted men, brought to destruction, perish. Apostasy from the faith leads them to the tomb. -Devouring flesh ravenously, drinking wine greedily. -Congregating on all sides to ensnare them, the people voraciously devour the quails. -Binding the bow against them, bringing them down. -Eagerly and enormously eating the half raw flesh, the pilgrims become plague-stricken. 31 During the night Pharaoh summoned Moses and Aaron and said, "Up! Leave my people, you and the Israelites! Go, worship the Lord as you have requested. 32Take your flocks and herds, as you have said, and go. And also bless me." 37 The Israelites journeyed from Ramses to Succoth. There were about six hundred thousand men on foot, besides women and children.38 Many other people went up with them, as well as large droves of livestock, both flocks and herds.39 With the dough they had brought from Egypt, they baked cakes of unleavened bread. The dough was without yeast because they had been driven out of Egypt and did not have time to prepare food for themselves. 40 Now the length of time the Israelite people lived in Egypt was 430 years. 41 At the end of the 430 years, to the very day, all the Lord's divisions left Egypt. 42Because the Lord kept vigil that night to bring them out of Egypt, on this night all the Israelites are to keep vigil to honor the Lord for the generations to come. Above left, chariot wheel fixed to axels standing at attention on the seabed. 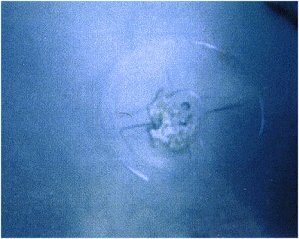 Above right a 4-spoked chariot wheel on the Red Sea seabed. 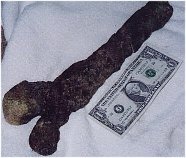 Found in 1998. Since reeds only grow in fresh water, scholars have looked for centuries for a fresh water lake the Israelites could have crossed and of course none exists. Could a more accurate word for the Hebrew phrase "Yam Suph" be "seaweed" instead of reeds? 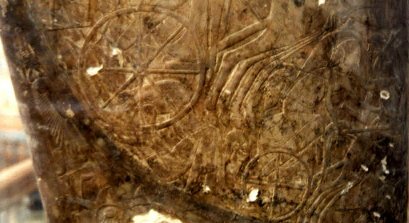 Could this be referring to the part of the present Red Sea known as the Gulf of Aqaba --where these chariot wheels were found? The name Red Sea probably stems from its proximity to Edom, the land occupied by the descendants of Esau, whose name in Hebrew means Red. In 1 Kings 9:26 we have a location that can be identified today to make it simple for us to tell where the Red Sea is. It was a port where King Solomon built and maintained a fleet of merchant ships. It was called Ezion Geber and you can still see its remains today near the resort city of Elat at the Northern end of the Gulf of Aqaba on the Red sea. read: Where was the Red Sea Crossing? In describing his favorite places, Terri Hurley wrote about Wadi Watir: The Sinai is a mountainous desert, and the Bedouin travel through, along, and over the ridges between the mountains. The sun is not up for very long in any wadi, because of the mountains, and it is important not to camp on the soft sand in the center of a wadi, because each one may drain as much as 100 square miles of desert, and even with no clouds visible, a wall of water can barrel down the Wadi at any moment! The view of the stars is unimaginable. 100+ miles from the nearest electric light bulb, the sky takes on an entirely new appearance. It doesn't take more than 2 minutes between shooting stars, and even with no moon, the light is bright enough to walk around. right side femur. Although it cannot be dated, it was evidently from ancient times. The man's height was estimated at 165-170cm (5.4-5.5 feet), and the bones had been replaced by minerals. 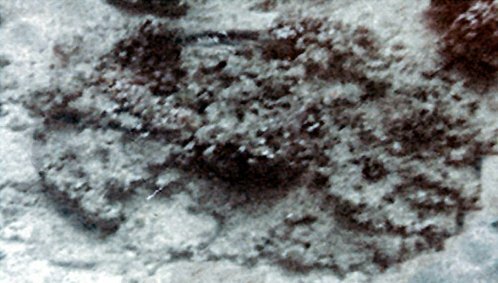 Tiny amounts of coral were growing off the mineral replacement. Aaron has seen the drop off of the southern end of the underwater land bridge. He has also seen a pathway that the Israelites would have cleared in order to cross the Red Sea, leading from the shore, descending into the sea. The Israelites would have had to push the stones and rocks aside in order to allow access for their wagons. Diodorus Siculus wrote, "In ancient times there happened a great plague in Egypt, and many ascribed the cause of it to God, who was offended with them because there were many strangers in the land, by whom foreign rites and ceremonies were employed in their worship of the deity. The Egyptians concluded; therefore, that unless all strangers were driven out of the country, they should never be freed from their miseries." Flavius Josephus was a Jewish historian born in AD 37. In his book, Josephus Against Apion, I., 26, 27, 32, he references two ancient Egyptian priest-scholars named Manetho and Cheremon. The ancient scholars, in reporting on Egyptian history, specifically name Joseph and Moses as Jewish leaders. "This people (the Israelites), by their own account, inhabited the coasts of the Red Sea, but migrated thence to the maritime parts of Syria, all which district, as far as Egypt, is denominated Palestine." The coasts of the Red Sea are, in part, located in current day Egypt, while the maritime parts of ancient Syria are, in part, located at what is current day Israel. Strabo, was a Pagan historian as well as a geographer, who was born in 54 BC. He also referenced the exodus account under the direction and leadership of Moses. "Among many things believed respecting the temple and inhabitants of Jerusalem, the report most credited is that the Egyptians were the ancestors of the present Jews. An Egyptian priest named Moses, who possessed a portion of the country called lower Egypt, being dissatisfied with the institutions there, left it and came to Judea with a large body of people who worshipped the Divinity." (Strabo,Geography, lib. xvi., c.2). 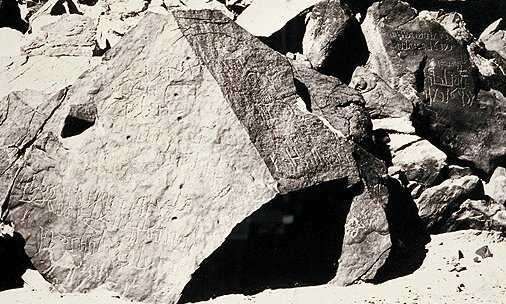 During the last century many explorers rediscovered a group of ancient inscriptions in the Wadi Mukatteb ("The Valley of Writing") on the Sinai Peninsula. It is commonly agreed that these inscriptions were made by the escaped Hebrew slaves of Egypt as they passed through the area under the leadership of Moses. While these inscriptions received much attention at first, the concept that these inscriptions were made by the Hebrews of the Exodus was summarily rejected by most scholars merely because they are most commonly known from the Bible. Their evidence was...well, no evidence at all, as they generally refused to even examine the inscriptions, the written record or the testimony of any of these explorers. They had made reference to an event related in the Bible and that was enough to refute that the inscriptions held anything of substance. Examiners concluded that, as the inscriptions had survived in such good shape for as long as the locals could recall in the dry, hot climate they could easily have survived since the time that the Exodus in thought to have occurred. A more detailed examination by Rev. Charles Forster, described in his book Sinai Photographed [London: Richard Bentley, 1852] asserted that the Hebrew characters throughout the inscriptions in the area had been obviously influenced in form by Egyptian hieroglyphics. 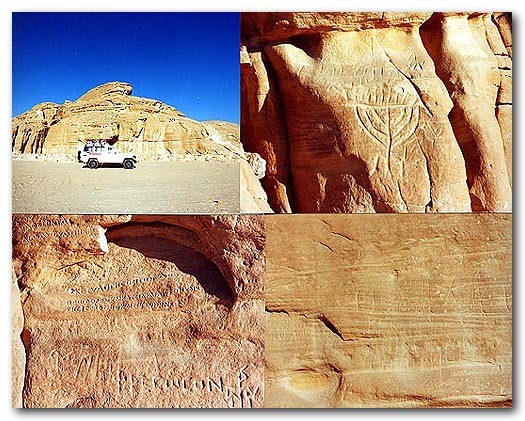 -A detailed examination of seven hundred of the actual Sinai inscription sites reveal only ten symbols that could reasonably be mistaken for the crosses that Prof. Stanley and other critical scholars refer to. And each of these can be easily explained as an example of the Egyptian cross-form (or their form of the letter "T" which appears in most written languages). The Egyptian cross-form is shaped more like an actual cross than most other T-shaped letters of other languages and could easily be mistaken for a "cross". Prof. Stanley made no attempt the hide the fact that he had little familiarity with the written languages of either Hebrew or Egyptian present in the inscriptions. -While it is undeniable that many of the medieval Christian pilgrims left similar inscriptions along their journeys historians, scholars and translators have rarely had any difficulty distinguishing them from ancient Hebrew inscriptions. The context and writing styles of both cultures tended to be dramatically different and few Christian pilgrims would have likely made inscriptions in Hebrew anyway, much less a Hebrew writing as heavily influenced by Egyptian as these inscriptions were. Furthermore, even to the casual eye of laymen present during the various examinations of these sites, both the Christian and Hebrew inscriptions were easily distinguishable. -Most scholars who have actually deigned to examine the Hebraic inscriptions have been forced to agree that they were written by the Exodus Hebrews. Further, all of the inscriptions sites which are obviously far too ancient to be the product of Christian pilgrims, occur on the western side of the Sinai (the side closest to Egypt) suggesting that the writers came from that direction. None of these sites contain either Christian or Jewish names (such as those common to citizens of Israel decades later) and no Christians lived in the western part of the Sinai during the times that these ancient inscriptions were written. -Those inscription describing Exodus events, especially miraculous events, are written in the context of having actually witnessed the events. That is, as an original account rather than an attempt to copy passages of the Torah/Old Testament or to paraphrase these texts. -No examples of Egyptian gods or similar symbols are found among these inscriptions as we have come to expect from Egyptian writers, even those few that contained specific illustrations. Nor is there any historical evidence of any group of Egyptians living in the Sinai in or around the time the inscriptions were made. This despite the fact that the writing style was heavily influenced by the Egyptian written language (as one would expect from the escaped Hebrew slaves of the Exodus).